Technical Specs: Blu-ray,BD-50 Dual-Layer Disc,Region "A"
Billed as South Korea's first disaster movie and the country's biggest budget feature to date ($11 Million Dollars), 'Tidal Wave', or 'Haeundae' as it was originally titled, is a refreshing take on the genre. Sure the plot's familiar -- insert an ensemble of melodramatic characters, including a scientist trying to warn people, and eventually toss them into a cinematic blender that is a special effects driven "event" -- but what makes 'Tidal Wave' feel new is the cultural variances between Korean and Hollywood cinema, and the filmmakers' decision to hold off on the mayhem. Where bigger budgeted disaster movies hurl viewers into a non-stop onslaught of the same action sequence over and over again (looking at you, '2012' -- which is definitely a fun movie, but repetitive), 'Tidal Wave' gives audiences a full hour of character moments before putting them in jeopardy. As far as character goes: 'Tidal Wave' opens on December 26, 2004 as a fishing boat sinks during the real Tsunami caused by the Sumatra-Andaman earthquake. Most of the men are rescued, save for one. Four years later, this lost fisherman has changed the lives of everyone involved. The man's daughter, Yeon-Hee struggles to fish and support her small restaurant. Man-sik, who was in charge of the fishing operations the night of that terrible tragedy, is a single father who drinks himself to death over his guilt while pining over Yeon-Hee. In another part of town, three rich girls on summer vacation meet three rich guys, only troubles arise when one of the young ladies falls for a lifeguard instead (this is a problem, much like Sun and Jin on 'LOST,' because they are from different classes). Lastly, we have Professor Kim, the scientist who sees the increasing number of regional earthquakes as a potential lead up to a "mega-tsunami" which are giant tsunamis caused by large scale landslides. Professor Kim is estranged from his wife, who has been raising their daughter alone (the little girl doesn't know the professor is her father). There's a lot going on, but what makes it so engaging is the cultural differences. Not knowing too much about South Korea, other than having seen a handful of recent movies such as 'The Host,' it's fascinating to see how characters act and react in just about any given situation. The tone is also quite quirky, jumping around from the tragic opening moments to comedic sight gags and fledgling romances. Other reviewers have commented that these characters are thin and just as bad as their American disaster film counterparts, but I disagree. One of the character strengths here is that many are far from perfect or heroic, yet their struggles are universal. Most wouldn't be featured in an American movie (note the rich girl who literally berates the lifeguard into a relationship with her). Because not everyone's sympathetic, it gave the film a sense of realism, despite the over-the-top melodramatics. As for the disaster elements themselves? Sadly, they're a mixed bag. With a budget this small, there's no way to compete with other movies costing ten to twenty times more. The film's greatest strength is that it waits to deliver the goods, so I was actually concerned for the characters when the fit hits shan. The effects themselves range from perfect (mostly wider shots, featuring less moving water) where I only knew there were CGI elements thanks to the behind-the-scenes featurettes, to downright poor. Again, as in 'The Perfect Storm' and 'Poseidon,' water is damn hard to replicate. Here they do admirably for the money involved, but fake effects tend to take you out of the moment. Also detracting from the film's climax are extended beats of heroism. Small trims would have picked up the pacing, ensured a modicum of believability, and saved us all from some cringe-worthy acting. 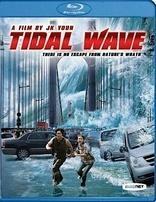 In the end, 'Tidal Wave' honors the disaster movie genre, and for me, stands out as refreshing because it holds back while displaying a culturally different landscape. Despite it's flaws (mostly due to budget and editing choices), it's a fun movie to watch from beginning to end, and even manages to toss in some really exciting thriller moments, most notably the bridge sequence, which finds a survivor trying to avoid shipping containers falling from a marooned tanker, and the terrifying notion of being inside a 17th story hotel room filled with water which is draining out the windows like a waterfall. The 50GB dual layer Blu-ray disc is Region "A" locked. Popping the disc into your player brings HD trailers for John Woo's 'Red Cliff,' 'District 13: Ultimatum,' 'The Warlords', and an advertisement for the high definition networks, HDNet and HDNet Movies. One great feature this Blu-ray provides (at least on my Playstation 3) is that when you play the disc a second time, it asks you if you'd like to continue from where you were last watching. Given the often grainy and muted look of the CGI visual effects heavily featured on the disc's main menu, 'Tidal Wave's' VC-1 1080p transfer (aspect ratio 2.39:1) is a surprise winner. It's worth noting that the source is highly saturated, but much like 'C.S.I.' it was the filmmakers' original intent to accentuate the story's summer setting and to contrast the muted palette when the titular tidal wave arrives, so no points were detracted for these elements specifically. However, minor banding issues do creep up within the blown out skylines. Effects issues aside, there are very few weaknesses to this digital transfer. Despite tons of moving elements, detail and delineation are excellent (note skin pores, live-action water, CGI birds, flesh tones, and hair). Blacks are solid too, especially the night scenes filmed with the harbor in the background (which showcase the movie's most convincing CGI effect, crabs crawling up onto a jetty). Grain does rear its ugly head during the effects-heavy moments, and though it seems intentional to the effects themselves, it does feel as though a few shots experience an unintended drop in resolution. Overall, the transfer's very accurate in representing what source material it's been given, though sadly, despite all good intentions, not all of these elements are equal (or aesthetically intended). The disc features two well crafted DTS-HD Master Audio 5.1 mixes (one Korean, and one in English). Essentially identical soundtracks, save for the voices speaking, my choice for reviewing the movie was the original Korean. The English dub was similar, but dialogue is a little too loud and the voice actors didn't capture the exact tones communicated by the original actors. Watching 'Tidal Wave' in English can save you reading for a couple hours and allow the eyes to explore more of the frame, but it makes most scenes hokey and the emotions feel off. Starting and ending with sonic bangs, 'Tidal Wave' still isn't able to compete with its Hollywood cousins, but the mix itself is genuinely successful. Dialogue is crystal clear (though again, the English dub is a little more muted). It's not an overly loud mix, which is good, because going from comedic moments to earthquakes won't make you reach for the remote. Crashing waves, shuddering thunder, and genuine chaos are well orchestrated and clearly defined. Where action sequences use every speaker and activate the LFE with great depth, quieter moments tend to be less immersive. Of course every scene doesn't have to call attention to itself, but given crowded settings like beaches, restaurants, and malls, the mix could have pulled the audience more into the film's world. Overall good, but not great. The disaster/destruction sequences are just shy of demo material. There are no other soundtracks available, but for subtitles you get English, English Narrative, English SDH, and Spanish. 'Tidal Wave' comes jam-packed with special features covering multiple production aspects, though sadly only two featurettes appear in high definition. Available only in Korean with English subtitles, these documentaries are informative and interesting, but probably more for fans of the film or Korean cinema, rather than casual viewers. They are as follows. The Making of Tidal Wave (45 minutes). Sound Mixing Part 1 (5 minutes). Sound Mixing Part 2 (9 minutes). CG Special Effects (23 minutes, 1080i HD). Cinematography (11 minutes, 1080i HD). 'Tidal Wave' is an odd, but genuinely fun movie that offers a refreshing take on the disaster genre thanks to cultural and tonal differences. Though not a perfect movie, by giving audiences a full hour of dramatics before mayhem ensues, one is able to connect with the eclectic group of characters portrayed on screen, and therefore care about their outcomes. Sure the effects don't line up with the digital toys available to Roland Emmerich or Michael Bay, but at one-twentieth the cost, the results are either impressive, or believable enough. For disaster fans, give this one a rent, but be ready to delve into some character, comedy and melodrama first.